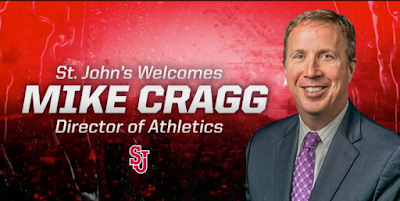 St. John’s University President Conrado "Bobby" Gempesaw, Ph.D., announced on Thursday that Mike Cragg has been selected to lead the Red Storm Athletic Department. 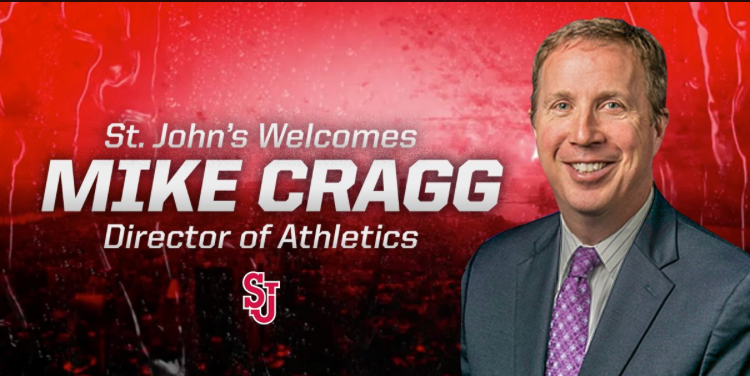 Cragg will become St. John’s seventh athletic director following a distinguished tenure at Duke University that spanned more than three decades. As part of his leadership role at the University, Cragg will serve on the President’s Advisory Council. During his 30-plus years in Durham, Cragg played a vital role in shaping the direction of Duke’s nationally acclaimed men's basketball program. The senior administrator for the men’s basketball team since 2000, Cragg most recently served as the Blue Devils Deputy Director of Athletics and Chief Operating Officer, overseeing facilities and planning for all 27 of Duke's athletic programs. “Mike Cragg has played an enormous role in the growth of Duke Basketball over the past three decades,” said Mike Krzyzewski, Duke University and former United States National Team Head Men’s Basketball Coach (2005-16). “Quite simply, Duke Basketball would not be where it is without Mike. In addition to spearheading Duke’s operations, a key component of Cragg's role also included fundraising, as he helped create the Duke Basketball Legacy Fund near the turn of the last century. Since its implementation, the fund has raised more than $115 million to help support the Blue Devils basketball program. He was also instrumental in developing the program’s naming gift endowment program that has received over $25 million in donations. In his role leading Duke’s facilities operations, Cragg was responsible for overseeing more than $300 million of renovation and new construction on campus since the year 2000. He was a member of the pivotal strategic planning team and then chaired a Master Facilities Plan, which serves as Duke’s blueprint and mission for the athletics department. Most notably, Cragg proved vital in the building of the Michael W. Krzyzewski Center and Pascal Fieldhouse, which have served the needs of the Blue Devil basketball and football programs, respectively. Cragg played a critical part in reconstructing Wallace Wade Stadium, the home of Duke Football, into a modern facility with improved fan-engagement and a superior gameday experience overall. A new club tower was constructed in 2016 that features 24 suites and a 750-person outdoor seating club. Outside of football and basketball, Cragg also helped envision new facilities that have furthered nearly all of the university’s programs. The Bostock Group, Duke’s $150 million facilities planning organization with a specific focus on football, also benefitted from Cragg’s leadership and vision. Created with the intention of elevating Duke Football while positively impacting all 27 varsity programs, the comprehensive plan began with the 2013 construction of new practice facilities for soccer and lacrosse. Additionally, the group also helped bring to fruition Morris Williams Track & Field Stadium and Kennedy Tower, the press and hospitality tower for Koskinen Stadium, the home of Duke’s soccer and lacrosse teams. Finally, the Scott Family Sports Performance Center, featuring a new Nike team store and a 13,000 square-foot Olympic Sports Strength and Conditioning Center, was constructed. During his time in Durham, Cragg served as the day-to-day contact with Nike, Inc., as part of a comprehensive all-sport partnership. He also held numerous administrative responsibilities within the basketball program, including the coordination of the annual K Academy basketball fantasy camp, the Duke Venture Capital Co-Investment Fund, the Coach K / Fuqua Conference on Leadership and the establishment of the Fuqua / Coach K Center of Leadership & Ethics (COLE). After arriving in Durham in 1987 as an assistant sports information director, Cragg spent 10 years as Duke’s sports information director beginning in 1990, handling the department’s day-to-day media relations. He also aided in running media operations at the NCAA Men’s Final Four on five separate occasions between 1993 and 2000. Cragg was promoted to associate athletics director in 2004 before being elevated once again in 2008 to the role of senior associate athletics director. Cragg plays an active role in the National Association of Collegiate Directors of Athletics (NACDA), serving on numerous committees and programs run by the organization. He also received a certificate in advance sports administration from the Sports Management Institute (SMI). “After 31 years at Duke, it is clear that it would take a special place for us to leave,” said Cragg. A native of Yakima, Wash., Cragg graduated from The University of Washington in 1986 with a degree in communications. He and his wife, Paige, have two children, Shelby and Michaela.